NASA announced that it has a couple of satellites that are helping to continuously map the Earth's 'metabolism'. They track the rate at which plant life is absorbing carbon (from carbon dioxide) out of the atomosphere. That shows the productivity of the Earth's carbon cycle. The rate of carbon fixation through photosynthesis is a basic property of life on planet Earth. It is the basis for capturing and storing the energy that fuels our world’s living systems and forms the foundation of the food webs. The oxygen we breathe is a byproduct of this photosynthesis. According to its creators, these new net primary productivity maps provide a fascinating new insight into the intimate connection between the living world and the physical world. 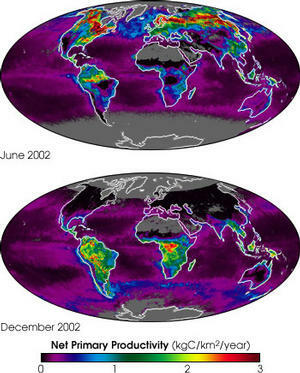 "We are literally watching the global garden grow,” says Steve Running, MODIS Science Team member and director of the Numerical Terradynamic Simulation Group at the University of Montana. “We now have a regular, consistent, calibrated and near-real-time measure of a major component of the global carbon cycle for the first time. This measure can also be the basis for monitoring the expansion of deserts, the effects of droughts, and any impacts climate change may have on vegetation growth, health, and seasonality." Notice that a lot of the productivity is in the oceans. About half of the total. Interesting to see those maps. It all isn't entirely in the areas I would have expected. A whole lot going on in Canada, Sweden, Siberia, and in the North Sea.